Summary: December 24 - A Cookie A Day Until Christmas! There’s nothing really “New & Improved”, I just wanted to get your attention. I don’t know about you, but I’m enjoying my Christmas Eve and not stressing over cookies. I have never met anyone that didn’t like Rice Krispie treats, but if you’re bored with them, try some of the optional mix-in’s. Merry Christmas! Melt butter in large pan. Add marshmallows and melt, stirring occasionally. At this point, you would add any food color or flavorings. Mix in cereal. Press into greased 9 x 13 pan. ½ teaspoon peppermint extract and 6 candy canes, crushed – Kelly’s idea! ½ cup peanut butter and top with a layer of melted chocolate – Some inspired person’s idea! 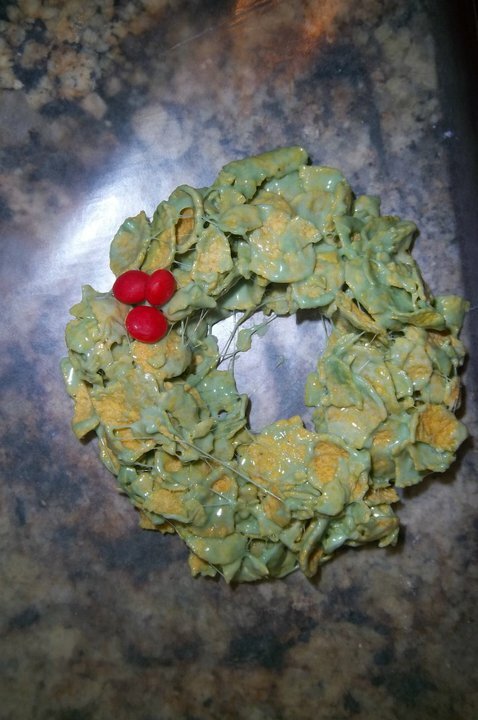 Substitute corn flakes, add green food coloring and red hots – Julie’s idea! Posted on December 24, 2010 by Karma in the Kitchen and filed under Cookies! and tagged Cookies!. Summary: December 23 - A Cookie A Day Until Christmas! I've been looking for Low Carb/Low Sugar recipes since one of my boys was diagnosed with Type 1 diabetes. As you can imagine, this will be a tough Christmas for him, because around our house there's A LOT of high sugar/high carb treats at Christmas time! I'm hoping this will be one he enjoys. A note about baking with almond flour, these cookies will not flatten out at all. You'll need to flatten them with either the bottom of a glass or a fork. That makes them look like a traditional peanut butter cookie, which is confusing to easily confused people. For you, Scott! Pre-heat oven to 350°. Line baking sheets with parchment paper or a non-stick baking mat. Stir together flour and Splenda. Blend in butter, egg and vanilla until well mixed. Form into 1-inch balls on a cookie sheet and flatten each with a fork or bottom of a glass. Sprinkle with additional Splenda. Bake for 8 minutes or until set but not brown. Allow to cool for 2 minutes on baking sheet then remove to wire racks to cool. Posted on December 23, 2010 by Karma in the Kitchen and filed under Cookies! and tagged Cookies!. Summary: December 22 - A Cookie A Day Until Christmas! Obviously, this is not an original recipe. I got it straight off the bag of Reese's peanut butter chips. However, I DID double it. They're pretty incredible cookies and I'm of the belief that you can never have enough ways to combine chocolate and peanut butter. Stir together flour, cocoa, baking soda and salt. Beat butter and sugar in large bowl with mixer until fluffy. Add eggs and vanilla. Beat well. Gradually add flour mixture. Stir in peanut butter chips. Bake 8 – 9 minutes. Posted on December 23, 2010 by Karma in the Kitchen and filed under Cookies!, Desserts and tagged Chocolate Happiness Cookies!. Summary: December 21 - A Cookie A Day Until Christmas! First of all, you should know that I love my friend Tammy Dee Monday McGee. (Doesn’t her name sound like the character in a children’s book? “Tammy Dee Monday McGee Learns About Chickens”. I would read that book!) Yes, I love my sweet friend Tammy. However, I’m a little iffy on these cookies. I did a little research and found some other recipes for “Dreamsicle Cookies” and none of them call for Tang… just boring things like orange extract and orange zest. Tang makes them very, very orange, which is a little funky for a cookie. Obviously, if you want to lose the Tang and use some other form of flavoring, compensate for the loss of sugar. In the meantime, I have a lot of cookies at my house if anyone’s hungry. Beat together all ingredients, except the vanilla chips. Stir in vanilla chips. Drop by Tablespoonfuls onto ungreased baking sheet. Bake in a 350º degree oven for 12-14 minutes. Posted on December 21, 2010 by Karma in the Kitchen and filed under Cookies! and tagged Cookies!. Summary: December 20 - A Cookie A Day Until Christmas! Once upon a time there was a boy named Ben. Ben loved all things buttery and rich. He loved Almond Roca Cookie Bars. Ben's mother could only find this delicious cookie bar mix at Sam's club. Ben's mom can't find it anymore so, she came up with this recipe. Ben hasn't tried them yet, but his mom thinks they're a winner. The End. Cream butter and sugar. Add vanilla. Mix with flour and salt. Press into the bottom of a 9 x 13 cake pan. Bake at 350º for 10 minutes. Remove from oven and sprinkle with toffee bits. Bake an additional 5-7 minutes. Remove from oven and sprinkle with chocolate chips and allow to melt. Spread chocolate over the surface of the cookie and sprinkle with almonds. Allow to cool and chocolate to set before cutting. Posted on December 20, 2010 by Karma in the Kitchen and filed under Cookies!, Desserts and tagged Chocolate Happiness Cookies!.